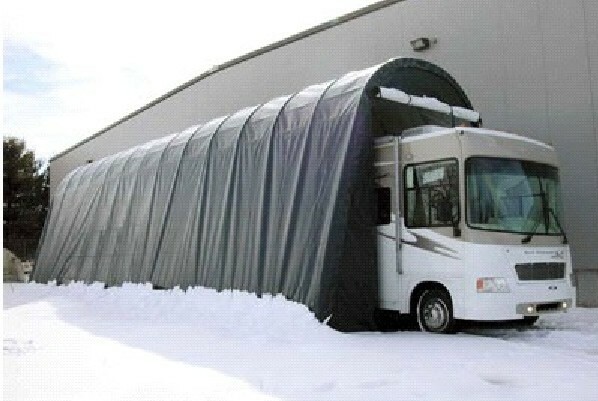 Fabric covered RV storage buildings and sheds have become the economical and flexible solution for storing motorhomes, travel trailers, 5th wheels, and boats. The metal framed buildings can be conveniently constructed on a variety of mounting surfaces including concrete pads, gravel, asphalt and concrete blocks. Fabric covered RV buildings offer a significant advantage over the traditional wood or metal storage building due to their 'portable' or temporary nature. This portable nature allows them to conventionally be erected without the need for building permits. As most homeowners or business owners understand, the process of obtaining a permit can be quite time consuming. Although this is typically the case, it is best to consult with local building authorities prior to purchasing a fabric covered RV building, garage, or shed. 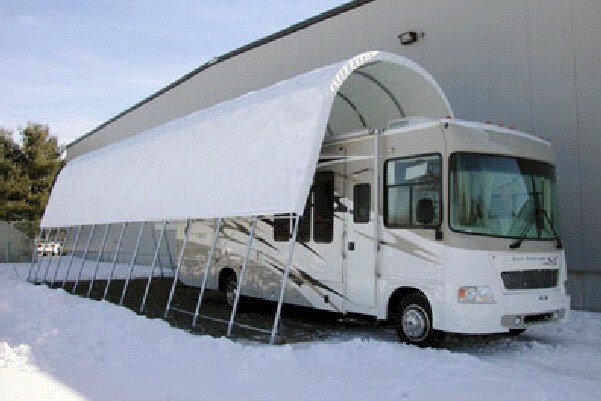 There a variety of RV buildings and carports available to accommodate almost any size motorhome or travel trailer. We invite all prospective purchasers to browse our user friendly site for our complete listing of RV sheds and garages.